Photograph taken from a Japanese plane, with HMS Prince of Wales at far left and HMS Repulse beyond her. A destroyer, either HMS Express or HMS Electra, is maneuvering in the foreground. This view was taken after the first torpedo attack, during which the Prince of Wales sustained heavy torpedo damage, around 1200 Hours on December 10, 1941. HMS Prince of Wales, HMS Repulse and four destroyers, HMS Electra, HMS Express, HMS Encounter, and HMS Jupiter, arrived in Singapore on December 2, 1941, to counter any Japanese aggression in Southeast Asia. Designated Force Z and commanded by Admiral Sir Tom Phillips (February 19, 1888 - December 10, 1941) the ships sailed the assigned new without aircraft carrier HMS Indomitable, which was damaged during trials off Jamaica. Instead, old carrier HMS Hermes was dispatched, but she was slow and left behind at Ceylon. After the Japanese landed in Malaya, Force Z moved to attack the landing force on December 8. After a close encounter on December 9 with the retiring Japanese invasion fleet, Phillips felt he had lost the element of surprise and set course for Singapore. On the morning of December 10, the newly arrived 22nd Air Flotilla consisting of the Genzan Air Group (from Woson, Korea, with Mitsubishi G3M twin-engined attack bombers and Mitushibshi A6M Fighters, the Kanoya Air Group with Mitsubishi G4M twin-engined attack bombers and the Mihoro Air Group with G3M bombers, launched a series of attacks from Vietnamese airfields. 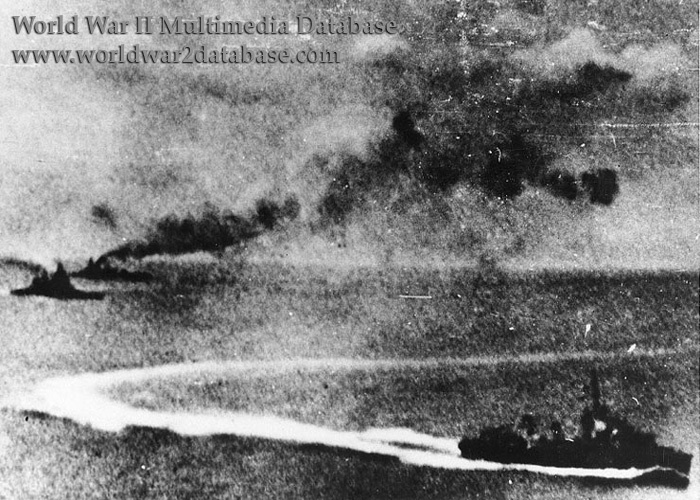 At 1140 the Genzan G3Ms scored four hits on Prince of Wales; At 1223, after two or four hits by the Kanoya Air Group, Repulse rolled over and sank. 840 British sailors, including Tom Phillips, were killed. The Japanese lost three aircraft and twenty-eight were damaged. Eighteen aircrew were killed. A version of this photo, which was heavily retouched by Japanese photo censors to show details on the British ships, is available in the Imperial War Museum archives.